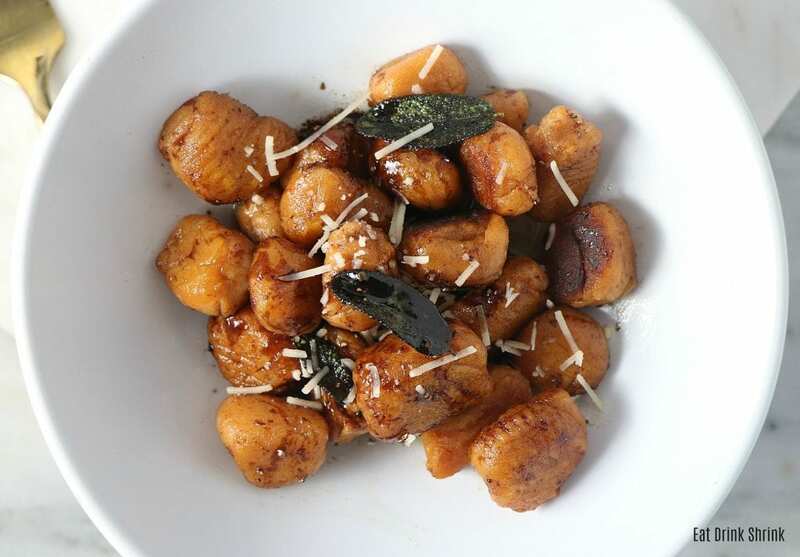 Vegan Sweet Potato Gnocchi with a brown butter sage sauce - Eat. Drink. Shrink. I alway looked at it through the lens of well, it’s just carbs, there is no nutrients and it just was never something I craved. Until I made, homemade pasta at NYU during undergrad. If there is anything that tastes a million times better homemade, it’s pasta! From a distance the concept of rolling out dough etc sounds exhausting and too involved. 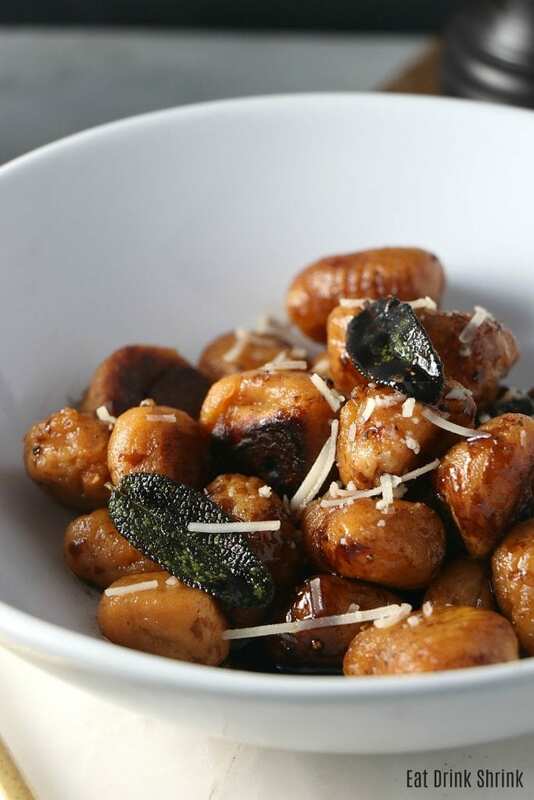 While it can be with using machines, gnocchi calls for simply creating a dough and cutting it into pieces. What’s even more wonderful is that, it really doesn’t matter if the gnocchi’s don’t come out into these perfect shapes and sizes. The point is the texture and flavor profile and I’m telling you, this one is going to blow you away! What I love about this dish is, everything! It has minimal ingredients, requires little effort, packs flavor, texture, sweet potatoes have more fiber, incorporates a hint of sweet with the balsamic, can easily be made in bulk, is perf for fall, and is non vegan approved! 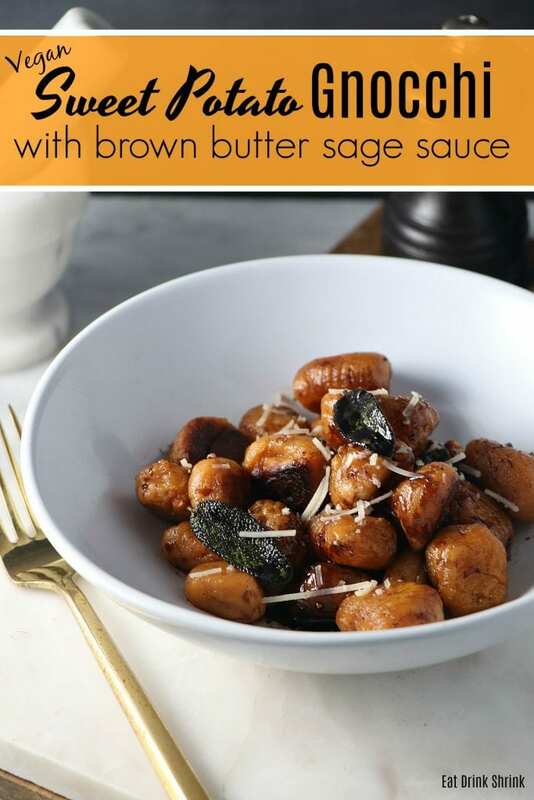 If you’re looking to break into the world of effortless homemade pasta.. You have to try my recipe for homemade Sweet Potato Gnocchi with a brown butter sage sauce! Add vegan parm, pumpkin puree, cinnamon, pumpkin spice, black pepper, and salt in a bowl. Mix well. Sprinkle half of the flour on the mixture, gently turn with spatula a few times to incorporate. Dump mixture on clean, lightly floured countertop or you can still do this in the bowl. Sprinkle remaining flour on top of the mixture. Gently knead with your fingertips, just bringing together the mixture until flour is incorporated through. This only should take a minute or two. Any longer and you will be over-kneading. Dust a clean, dry surface with a generous sprinkling of flour. Divide dough into 4 parts. Take one part and roll into a long log. 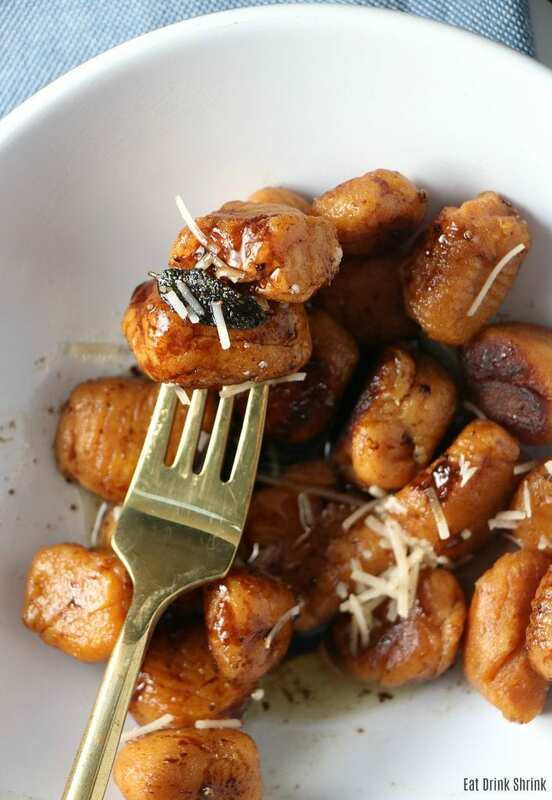 Cut gnocchi into 1/2 inch pieces. Heat a large frying pan or saute pan with just 1 tablespoon of the vegan butter and 1 tablespoon of olive oil. 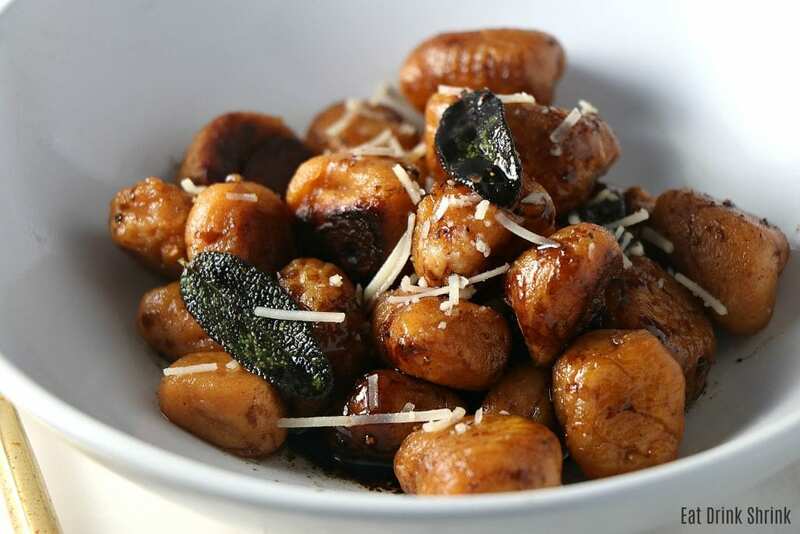 When hot, add a few gnocchi – enough to cover surface but not touch each other. Fry on medium heat for 1-2 minutes, turn and fry for another 1-2 minutes. Remove gnocchi, place on large baking sheet to put into oven to keep warm. Repeat with rest of gnocchi. When all gnocchi is finished, discard butter/oil in pan and clean pan with paper towel. Heat pan on medium heat and when hot, add the remaining 2 tablespoons vegan butter and the remaining tablespoon of olive oil. When hot, add the fresh sage. Let the sage brown and sizzle (but not burn) for a couple of minutes until very fragrant. Remove the sage or if you love it like me, keep it! To the pan, add the balsamic vinegar and whisk. Let simmer on low for 1 minute and pour over the gnocchi. Top with vegan parm and crispy sage as garnish. Hi! They came out absolutely delicious and I was really pleasantly surprised by the sage. I am thinking of frying it up and adding it into the gnocchi next time before frying them. The recipe was a tid bit confusing, however. I wasn't sure when to add the sweet potato so I added it to all the spices and half the flour at the beginning before putting it on a table and adding more flour over it to knead. I also cooked the sweet potato well in advance and let it cool to room temperature. And I cut the pieces to 1" but I think next time I will cut to 1/2". I really really enjoyed this recipe thanks so much!